Carlos Garaicoa, Postcapital, 2006, wood, metal,polychromed plaster, PVC, cardboard, courtesy of Galleria Continua inSan Gimignano, Italy and Beijing, China, (image). Promised Gift ofSherritt Corporation International. (Toronto: February 20, 2008) Postcapital, an elaborate workby renowned contemporary artist Carlos Garaicoa, will join the ArtGallery of Ontario's permanent collection as part of a five-yearpartnership between the AGO and Sherritt International Corporation.Over time the partnership will result in the formation of a Cuban artcollection at the AGO. Carlos Garaicoa is one of Cuba's leading contemporary artists. Postcapitalis a display of small architectural models of world famous nationalmonuments representing a new global metropolis. 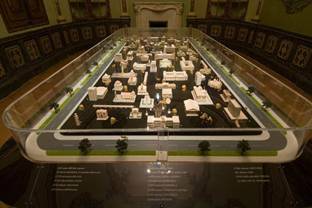 Each architecturalmodel is derived from a different national currency, some familiar,such as Ottawa's Parliament Buildings from a $10 note, while others areless well known, such as a range of modernist structures frompost-colonial Africa. Postcapital presents the possibility of a world without different currencies. "The Sherritt collection at the AGO will illustrate how thecountry's creativity is flourishing and bring these works to newaudiences," says AGO's curator of contemporary art, David Moos.Focusing on the diversity and ingenuity of Cuban art, Moos is workingwith Havana-based independent curator Magda Gonzalez-Mora to selectworks that will find a focus in the Sherritt Collection at the AGO. One of the largest foreign investors in Cuba, Sherritt International isa Canadian natural resource company that produces nickel, cobalt, oil,coal and electricity. Through its partnership with the AGO, SherrittInternational is enhancing its involvement in Cuba and Cuban culture bycreating a lasting contribution of Cuban art to the AGO. Garaicoa was born in 1967 in Havana, where he currently lives andworks. He studied visual arts at the Instituto Superior de Arte in Cubafrom 1989 to 1994. Using multi-media to convey themes of urbanism andpolitics, his work examines day-to-day life in Havana and the gapbetween political idealism and the hardships of everyday life.Garaicoa's work can be found in numerous public collections, includingThe Museum of Modern Art (MOMA), New York and Tate Modern, London. Heis represented by Lombard-Freid Fine Arts in New York and GalleriaContinua in Italy. Postcapital will be on view in the new contemporary galleries when the AGO reopens in fall 2008.